In our work, we always strive to focus on long term impact. That’s why whenever possible, we involve scholarship students in the various programs we carry out, training up the next generation of Nicaraguans to respond to the needs of their community. This month, Magdiel, Ashlee, Litzy, and Francis helped lead our children’s ministry programs at Máximo Napoleón Baldelomar Elementary School. Under the supervision of staff member Martha Cortedano, the girls led group games with the kids and assisted in teaching a lesson about the life of Paul. Through a fun animated video and review games afterwards, the children learned how Paul’s encounter with Jesus on the way to Damascus changed his life. Despite being a persecutor of the church, God transformed him into a preacher and missionary that gave his life to spread the gospel. The kids also learned about the persecution Paul faced as a Christian. The main focus of the lesson was that no matter what difficulties we go through, God is always there to help us. 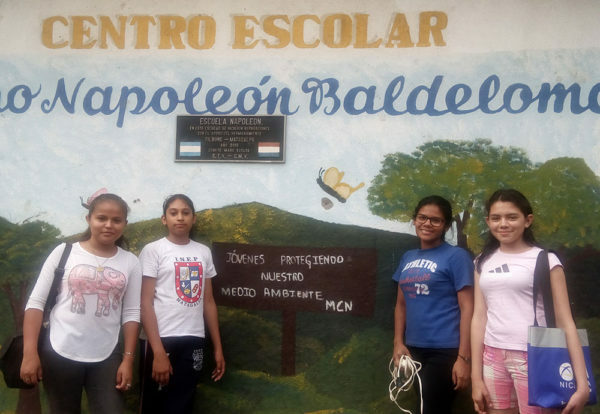 This message is especially relevant given the current situation in Nicaragua, and we are so proud to see girls like Magdiel, Ashlee, Litzy, and Francis stepping up and sharing hope with those who are younger than them. This entry was posted in Blog on July 25, 2018 by Scott Finlayson.